AC Klagenfurt’s star Canadian legionnaire SAM GAGNER (97), the 23-year-old center who totaled 18 goals and 47 points in 75 NHL games for the Edmonton Oilers last season and was a member of the Canada select national side that captured the 2012 Spengler Cup title in Switzerland just after Christmas, finished his European tour as the highest-scoring NHL refugee to have skated with an Austrian-based club in the 12-team Erste Bank Eishockey Liga during this 2012/13 campaign. 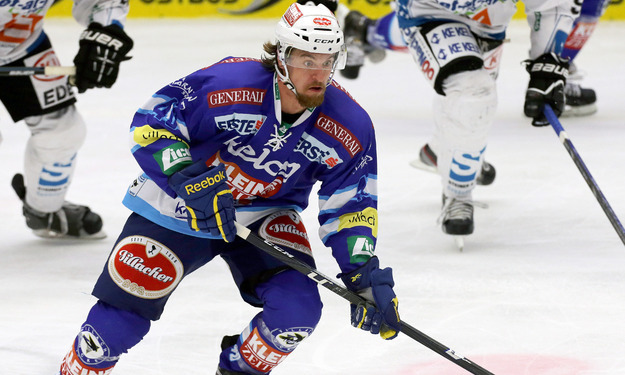 The highest scoring National Hockey League exile to have competed in the ERSTE BANK EISHOCKEY LIGA, a multi-national circuit which consists of teams located in Austria, Croatia, the Czech Republic as well as Slovenia, this term turned out to be little-known JAN MURSAK. The developing 24-year-old right wing, who appeared in 44 NHL games (2 go, 4 pts) for the Detroit Red Wings in the previous two seasons combined, had spent the majority of his first four years as a professional skating for the Grand Rapids Griffins (190 ga, 39 go, 87 pts) in the American Hockey League. Now that the “Lock-Out” has been settled, it will be interesting to see if the Slovenia international claims a regular NHL spot with the Red Wings in 2013. SV Villach’s star left wing MICHAEL GRABNER, the 25-year-old who was selected in the first round (# 14 overall) of the 2006 National Hockey League Draft by the Vancouver Canucks and had scored 54 goals the past two NHL seasons for the New York Islanders before the “Lock-Out” went into effect, finished as the highest-scoring Austrian NHL exile to have appeared in the Erste Bank Eishockey Liga this term. There is little question that the Oesterreichischer Eishockeyverband (Austrian Ice Hockey Association), which celebrated its 100th Anniversary with a friendly international against neighboring Germany earlier this past fall, would have loved to see the “Lock-Out” situation that shut down the National Hockey League in North America continue on just a little bit longer, then — at least until the pivotal Olympic qualification tournament next month in Deutschland had been completed, that is. There can be no doubt that Austria national team trainer EMANUEL VIVEIROS, the native Canadian who skated 29 NHL games (1 go, 12 pts) while patrolling the blue line for the since-departed Minnesota North Stars back in the day, would have been thrilled to be able to deploy three bona-fide NHL veterans in the attack against Germany, Italy and the Netherlands. Surely, prolific left wing THOMAS VANEK, who has topped the impressive 40-goal plateau for the Buffalo Sabres twice in his career and also participated in the prestigous NHL All-Star Game, would have been of particular value to the Austrian Olympic cause next month. But it’s all water under the bridge now, of course. Because of NHL commitments, Vanek has only ever managed to appear for Austria at a major international tournament twice (12 ga, 3 go, 11 pts) in his career. The 28-year-old was able to skate with the national team at both the 2004 and 2009 IIHF World Championships but that has been the extent of Vanek’s experience at the highest level of international competition. Vanek did appear with Austria in 2008 for the IIHF World Championships – Division 1 (the old B Pool) tournament where the Buffalo Sabres left wing dominated by posting five goals and 10 points in only five games. New York Islanders winger MICHAEL GRABNER, the 25-year-old who registered four assists in five games for Austria at the annual IIHF World Championships – Division 1 Group A event last spring in Slovenia, has never participated at a major international tournament thus far in his career. EC Graz 99ers’ star left wing THOMAS VANEK (20), the former NCAA champion at the University of Minnesota who has totaled 230 goals and 447 points in 547 NHL games for the Buffalo Sabres over the course of his productive career in North America, will not be available to the Austria national team for the vital XXII Winter Olympic Games qualification tournament to be contested next month in Bietigheim-Bissingen, Germany. Youthful Eisbaeren Berlin defenseman THOMAS SUPIS (6), the 20-year-old who appeared for Germany in the second tier at the annual 2012 IIHF World Junior Championships, harasses EC Red Bull Salzburg winger THOMAS RAFFL (5), the 26-year-old who recently spent two seasons with Swedish elite league side HF Lulea and has already represented Austria at the annual IIHF World Championships on four occasions, during the summertime European Trophy match at the tiny Red Bull Arena in Austria. Just considering all the domestic titles the two teams have each collected in recent seasons alone, the noteworthy international collision of contemporary German powerhouse EISBAEREN BERLIN and growing Austrian giant EC RED BULL SALZBURG is blossoming into a real compelling encounter on the other side of the Pond nowadays. Throw in the minor fact that the two countries share a common language. Also add in the little item that the highly-accomplished (and National Hockey League-experienced) head coach of one team used to be top man behind the bench at the other club before signing on with his current employers. What results is a genuine European rivalry for any ‘neutral’ ice hockey observer to behold and enjoy. Canadian trainer PIERRE PAGE had the last laugh last season in the German capital city, then. The former Eisbaeren Berlin trainer previously in charge of the Minnesota North Stars, Quebec Nordiques, Calgary Flames and Anaheim Mighty Ducks in the NHL successfully guided his EC Red Bull Salzburg troops to a 5-0 whitewash of their hosts at the O2 World Arena in this very same European Trophy tournament a year ago. But, this season at the Red Bull Arena in Austria, veteran American trainer DON JACKSON — the former rugged NHL defenseman who earned two Stanley Cup rings with skillful Wayne Gretzky and the mighty Edmonton Oilers — have turned the tables in the exact opposite direction. Diminutive Canadian defenseman MARK KATIC (71), the 23-year-old, former third round selection (# 67 overall) of the New York Islanders from the 2007 National Hockey League Draft who spent most of the last three seasons skating for the Bridgeport Sound Tigers in the American Hockey League, attempts to fend off the forechecking ANDREAS KRISTLER (40) of EC Red Bull Salzburg during the European Trophy contest at the compact Red Bull Arena in Austria. 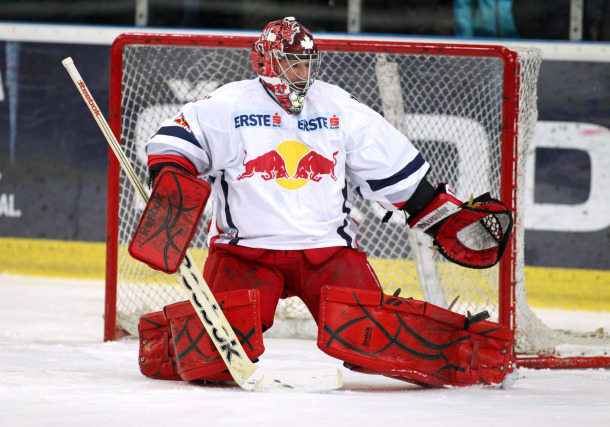 One might have expected more of EC Red Bull Salzburg’s experienced NHL goaltender ALEX AULD, it must be said. The 31-year-old Canadian import, who has appeared in 237 NHL games over the course of his well-traveled career and spent all of last season with the Ottawa Senators, was something less than spectacular. A very soft goal conceded from center ice off the stick of American defenseman JIMMY SHARROW, a 27-year-old native of Framingham, Massachusetts, who played five seasons of professional hockey in North America but never made it the NHL ranks, broke the back of EC Red Bull Salzburg and prompted Auld’s removal after the second period. 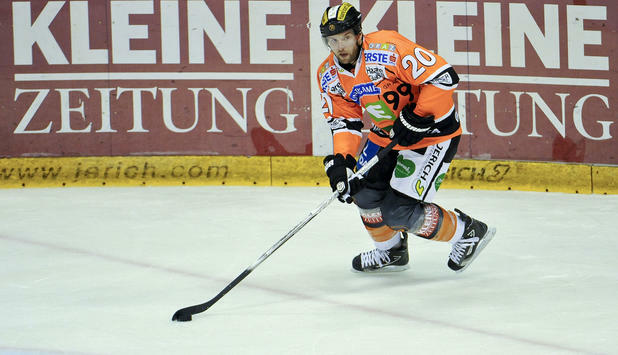 Eisbaeren Berlin, the reigning two-time defending champions who have won the Deutsche Eishockey Liga title four of the last five years, got a big lift from incoming Canadian legionnaire JAMIE ARNIEL with just four minutes remaining in the opening period. The 22-year-old winger who skated exactly one contest for the 2010/11 Stanley Cup champion Boston Bruins announced his addition to the Eisbaeren line-up with a goal on the rebound. Another strike early into the second period by Olympic winger ANDRE RANKEL, the 26-year-old who has appeared with Germany at seven major international tournaments, had really put the screws to EC Red Bull Salzburg, who have won the Austrian title three times (’08, ’10, ’12) since Page assumed command to start the 2007/08 campaign, as well. The home side in the Red Bull Arena did not lack for glorious opportunities to get themselves on the scoreboard. But the typically reliable ROB ZEPP, a former Carolina Hurricane farmhand who spent two years with Saipa Laappeenranta in Finland before signing Eisbaeren Berlin to begin the 2007/08 season, was not about to let that happen. The 30-year-old Canadian twice halted EC Red Bull Salzburg shooters on the clean breakaway and showed why the national team of Germany had given Zepp two starts between the pipes at the 2010 IIHF World Championships. Zepp, it should be remembered, gave a very respectable performance in saving 30 of 32 shots as the host nation fell to powerful Russia — who got goals from NHL stars PAVEL DATSYUK of the Detroit Red Wings and EVGENY MALKIN of the Pittsburgh Penquins on that day — by the minimum margin at the semifinal stage that year. Eisbaeren Berlin center T.J. MULOCK (15), the native of western Canada who skated for Germany at both the 2009 IIHF World Championships and 2010 Winter Olympic Games, and Red Bull Salzburg center STEVE REGIER (41), the former New York Islanders and St. Louis Blues forward who is entering his fourth season with the favorite ice hockey club of the world-renowned energy drink manufacturer, face-off during the interesting (if one-sided) European Trophy match at the miniscule Red Bull Arena. EC Red Bull Salzburg sent American rookie professional SHAWN HUNWICK, who did make one appearance in the NHL for the Columbus Blue Jackets last spring after concluding his collegiate career at the University of Michigan, out onto the ice to tends the nets for the final twenty minutes. The 25-year-old, of course, follows the “Red Bull Road Less Traveled” to the Austrian Alps blazed last season by fellow Wolverine alum and former NHL veteran goaltender MARTY TURCO. Hunwick managed to keep his sheet clean and Page’s charges even pulled a goal back in the third period through young defenseman ALEXANDER PALLESTRANG. But an empty net strike from the journeyman Sharrow in the last minute set the final numbers at 4-1 in favor of the visiting Eisbaeren Berlin, who notched the European Trophy title a couple of seasons ago in 2010. EC Red Bull Salzburg defenseman DOMINIQUE HEINRICH (91), the versatile 22-year-old who represented Austria in the second tier of the annual IIHF World Championships last season, looks to split the pressuring Eisbaeren Berlin pair of center DANIEL WEISS (57) and forward LAURIN BRAUN (12) during the late summer European Trophy date in front of 2,689 spectators at the Red Bull Arena (which has the official capacity for an audience of 3,200) in the Austria. The cozy EISARENA SALZBURG, with its official capacity of 3,200 spectators for ice hockey matches, was actually originally opened more than half a century ago in 1960. And the fourth-largest city in the central European nation of AUSTRIA first claimed a team in country’s elite circuit, the Bundesliga, to begin the 1972/73 campaign. But the spectacular emergence of EC RED BULL SALZBURG as a legitimate national powerhouse which has posted four domestic titles over the past six seasons is a very recent phenomenon that occured only in the last decade, itself. 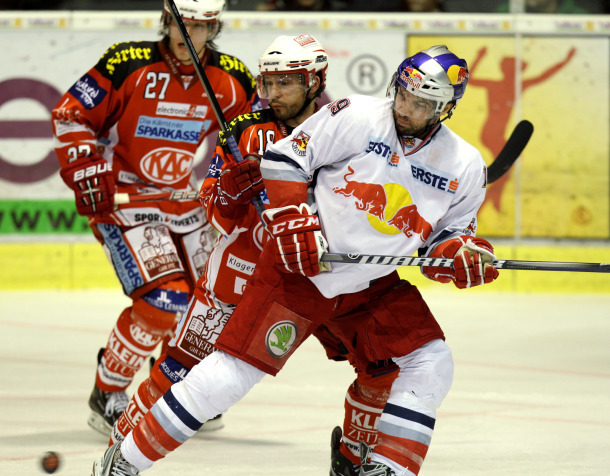 The world-renowned Austrian energy drink manufacturer RED BULL GMBH had its first involvement with professional ice hockey during the 1987/88 campaign as a sponsor of the ill-fated Eishockey Club Salzburg. This particular squad featured aging international stars SERGEI KAPUSTIN and VIKTOR SHALIMOV, a pair of gold medalists with the Soviet Union national team at the 1976 Winter Olympics in Innsbruck, and finished a respectable fourth place in the league standings. Nevertheless, though, EC Salzburg would fold after the season. Chicago native ROBBIE EARL (10), who won an NCAA championship with the University of Wisconsin in 2006 and skated in 47 National Hockey League contests for the Toronto Maple Leafs and Minnesota Wild in five seasons as a North American professional before crossing The Pond to play in Europe for the first time ever this past summer, finished the 2011/12 campaign as the highest-scoring import on the roster of former NHL head coach Pierre Page’s EC Red Bull Salzburg. EC Salzburg would be revived with the merger of the smaller EC Morzg and EC Tiefenbach clubs prior to the start of the 1995/96 domestic schedule. This new enterprise was financially-backed by the local KAINDL FLOORING KG company, a world leader in wood products, laminate and wood flooring, but the relationship would not last long. Red Bull GmbH decided once again to invest in the club and became the major corporate sponsor prior to the 2000/01 season with the second division team taking on the name of EC THE RED BULLS SALZBURG. To start the 2004/05 season, the club was completely taken over and totally restructured by the Red Bull GmbH company, which was by now also the sole owner of a soccer team in the Austrian Bundesliga. Major changes in Salzburg including improvements to the ice hockey facilities and other club infrastructure soon followed. Significantly, a farm club was founded to compete in the Austrian second division (die Nationalliga) and provide experience for younger players graduating from the new, beefed-up youth team program. Montreal native RAMZI ABID (19), who was originally drafted by the Colorado Avalanche in the 2nd round (# 28 overall) of the 1998 National Hockey League Draft before skating in 68 NHL games for the Phoenix Coyotes, Pittsburgh Penquins, Atlanta Thrashers and Nashville Predators, suited up for first division clubs in Switzerland, Russia and Sweden before signing for EC Red Bull Salzburg in the summer of 2010. To help better project its corporate identity as the Alpine city celebrated a team back in the top flight of Austrian ice hockey (now known as the Erste Bank Eishockey Liga) for the first time since the late 1980s, the club name was changed also once again to its current moniker of EC RED BULL SALZBURG at the beginning of the 2004/05 campaign. EC Red Bull Salzburg finished at the very bottom of the standings on its return to the Austrian elite league but the accomplished HARDY NILSSON, who had last been serving as the national team trainer of Sweden from 2000 thru the World Cup of Hockey in 2004, was hired and led a startling transformation the very next season. Nilsson, who previously led three different German clubs (EC Cologne, Munich Barons, EG Dusseldorf) to a total of five domestic titles before steering Swedish elite league club IF Djurgarden Stockholm to a pair of back-to-back championships to help ring in the start of the new millenium, guided his latest charges straight to the top of the 2005/06 regular season chart. 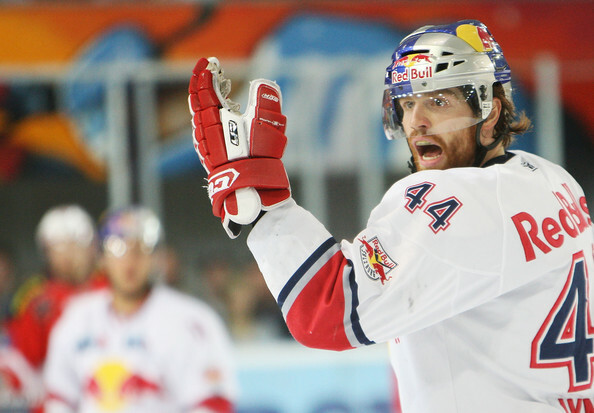 Although the club did fall to EC SV Villach in the playoff final, Nilsson and EC Red Bull Salzburg rebounded to claim a first-ever Austrian title in 2007 with a decisive victory in a rematch of the previous term’s playoff final. Nilsson was subsequently moved upstairs into a front office position for EC Red Bull Salzburg and former NHL head coach PIERRE PAGE was brought on board for the 2007/08 schedule. The native of Saint-Hermas in the Canadian province of Quebec, who had plenty of experience behind the bench with the Minnesota North Stars, Quebec Nordiques, Calgary Flames and Mighty Ducks of Anaheim as well as Swiss club HC Ambri Piotta, arrived in Austria after five seasons and two German domestic titles (2005 and 2006) with Eisbaren Berlin. Page, who has been instrumental with the development of a program entitled “International Ice Hockey Development Model” being run out of the team’s Thalgau training center, brought about another championship in his first term with EC Red Bull Salzburg and also added two more in 2010 and 2011. Austria international defenseman MATTHIAS TRATTNIG (51) of EC Red Bull Salzburg, the well-traveled 32-year-old veteran who won an NCAA championship with the University of Maine a year after being chosen by the Chicago Black Hawks in the 4th round (# 94 overall) of the 1998 National Hockey League Draft and later spent the 2004/05 season with the Syracuse Crunch in the American Hockey League, collides with AC Klagenfurt’s Austria international left wing DAVID SCHULLER (45) during the quarterfinal round of the Erste Bank Eishockey Liga playoffs completed earlier this season. This season, EC Red Bull Salzburg and Page enjoyed the luxury of two former NHL All-Star Game participants who both won the Stanley Cup with the powerhouse Edmonton Oilers in the spring of 1987 — Finnish defenseman REIJO RUOTSALAINEN and Swedish forward KENT NILSSON — assisting on the coaching staff. Ruotsalainen, who also collected an Olympic silver medal for Finland at the 1988 Winter Games in Calgary, has been in the Austrian Alps with Page since 2007. Nilsson, the first European player to ever post 100 points or more in a single National Hockey League season, was in his first year as an assistant coach in Austria this term after many years functioning as an NHL scout for the Oilers. Despite this and the presence of highly-experienced NHL goaltender MARTY TURCO in between the pipes, EC Red Bull Salzburg failed to achieve an unprecented third consecutive E.B.E.L. title for their energy drink paymasters this season. 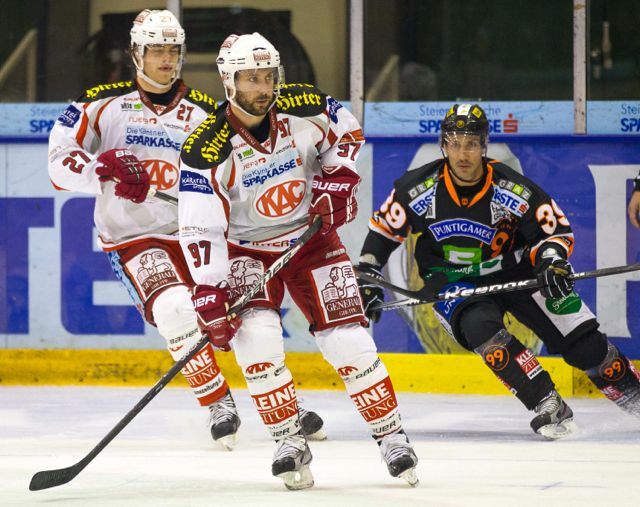 Courageous EC AC Klagenfurt rallied from down a two games-to-one disadvantage to win the best-of-seven quarterfinal series with their Tyrolean opponents. Still, four titles in six years is not such terrible stuff — no matter what country the club is skating in! North Vancouver native DOUG LYNCH, the 28-year-old rearguard who was drafted in the 2nd round (# 43 overall) by the Edmonton Oilers at the 2001 National Hockey League Draft and later logged two NHL games in his rookie season of professional hockey, originally signed to play for EC Red Bull Salzburg in Austria after spending the 2006/07 campaign with the Peoria Rivermen in the American Hockey League. Sault Ste Marie native MARTY TURCO, who won two NCAA titles with the University of Michigan before appearing in 509 National Hockey League games for the Dallas Stars, signed with Erste Bank Eishockey Liga club EC RED BULL SALZBURG earlier this season just in time to help the Austrian club capture the European Trophy for the 2011/12 campaign. Not many National Hockey League teams, defending Stanley Cup champions included, looking to acquire a little help in net ever culminate their serach for a new goaltender in the same Austrian Alpine town that produced the legendary composer Wolfgang Amadeus Mozart. But, after second-string TUUKKA RASK picked up an abdominal / groin injury that is expected to keep the 25-year-old Finnish shot-stopper sidelined for a minimum of four weeks recently, this is exactly what transpired for the fabled franchise of the BOSTON BRUINS. Plucked from the players roster of the freshly-elminated EC Red Bull Salzburg club and signed for the rest of the season on a pro-rated contract worth $ 600,000 was highly-experienced NHL veteran MARTY TURCO. 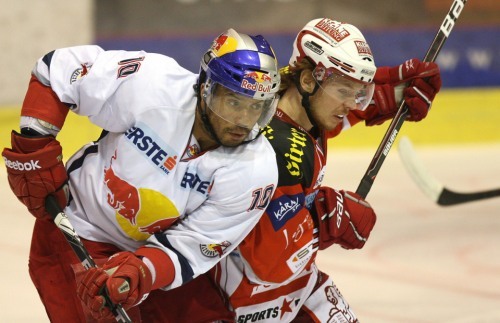 EC Red Bull Salzburg, who had won the Erste Bank Eishockey Liga title four of the past five years including the last two crowns entering this season, were eliminated at the quarterfinal stage of the EBEL playoffs this time around by EC AC Klagenfurt in six matches after blowing a two games to one advantage. Turco, who appeared in 29 NHL games (3.02 gaa, .897 sv pct) for the Chicago Black Hawks a year ago, started every post-season contest between the pipes for EC Red Bull and recorded a 3.16 goals-against-average along with a .911 save percentage; the 36-year-old veteran took over the first string duties in Salzburg from former Phoenix Coyotes farmhand JOSH TORDJMAN when he signed for the Alpine club in the middle of this past December, just in time for the “Red Bull Salute”, the final tournament in the competition known as the European Trophy. Boston Bruins back-up goaltender MARTY TURCO (1), who has participated in three NHL All-Star Games throughout his career, focuses on the puck with Pittsburgh Penquins center CRAIG ADAMS (27), the former ninth round selection (# 223 overall) out of Harvard University by the Hartford Whalers at the 1996 NHL Draft, in front during the National Hockey League contest at the Consol Energy Center in western Pennsylvania. Turco was added as cover for Boston Bruins’ 2012 NHL All-Star Game participant TIM THOMAS, a silver medalist for the United States at the 2010 Winter Olympic Games in Vancouver. 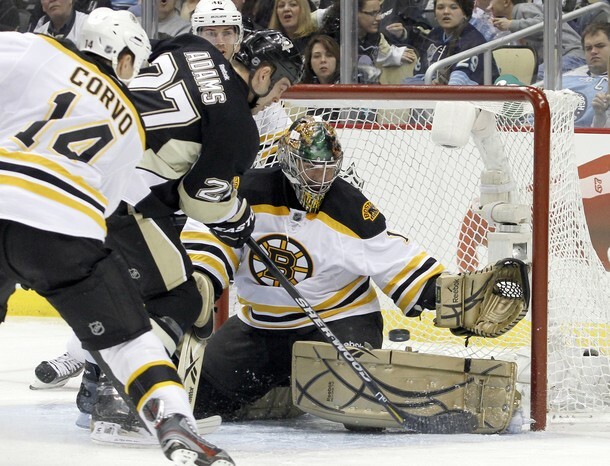 Because the new arrival from Austria was signed after the offical trading deadline from a team outside the National Hockey League, the Bruins will not be able to activate Turco in the NHL playoffs. Still, three consecutive goals in the first period from the Pittsburgh Penquins on Sunday saw to it that Thomas was given some time off by Boston Bruins head coach CLAUDE JULIEN. And so out skated the one-time Dallas Stars’ fifth draft pick (# 124 overall, 1994) to finish out the final two periods for his new NHL club. The Penquins went on to put away the visiting Bruins for a 5-2 victory but Turco did acquit himself well in front the Pittsburgh faithful and a national television audience watching on NBC. In all, the aging veteran turned aside 20 of 22 shots on his productive forty-minute debut for Boston. Exactly how many times Julien will turn to the battle-tested Turco the rest of this 2011/12 season remains to be seen by the wicked hard-core supporters in Beantown. Boston Bruins goaltender MARTY TURCO(1), who was the third string goaltender for Canada at both the 2005 IIHF World Championships as well as the 2006 Winter Olympic Games, makes a sprawling, Dominik Hasek-style save to rob Pittsburgh Penquins center JORDAN STAAL (11), the second player selected overall at the 2006 NHL Draft, during the National Hockey League contest at the Consol Energy Center in western Pennsylvania. 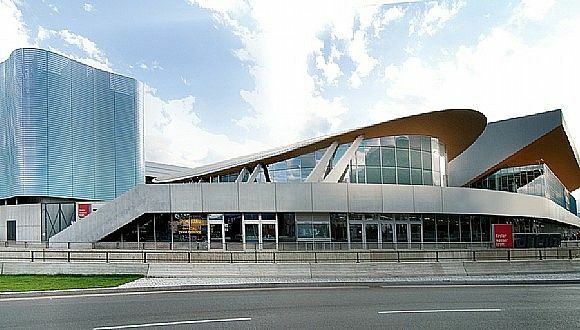 The historic OLYMPIAHALLE, as denoted in the above layout as the Olympic ice stadium, is just one of several athletic facilities which, today, comprise the so-called OLYMPIAWORLD sports park in the Austrian city of Innsbruck, which twice played host to the Winter Olympic Games in both 1964 and 1976. Neither the TIVOLI-NEU STADION (Tivoli Stadium, above) nor the TIROL WASSERKRAFT ARENA (Tyrolean Ice Arena, above) both even existed at the time XII Games of the Winter Olympiad in February of 1976. The Tivoli-Neu football (soccer) stadium, named after the original Tivoli Stadion which was located in a different part of Innsbruck next to the Sill River, was not completed until 2002 and the Tirol Wasserkraft Arena would not arrive for another three years, just in time for the Tyrolean city to host the annual International Ice Hockey Federation World Championships in 2005. A photo of an entrance to the oval-shaped TIVOL WASSERKRAFT ARENA, the home to Austrian Nationalliga (second division) club HC TWK INNSBRUCK, with the neighboring OLYMPIAHALLE off to the right at the Olympiaworld complex in the capital city of the state of Tyrol.